Ghana striker David Accam has signed for Major League Soccer side Chicago Fire on a long-term contract, subject to international clearance. The 24-year-old, who has been called up for the Black Stars but is yet to make his international debut, joins from Swedish side Helsingborgs IF for an undisclosed fee. 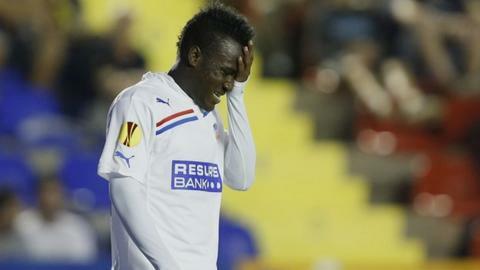 Accam joined Helsingborgs from Östersunds FK in August 2012 and scored 38 goals in 81 appearances for the The Reds. Accam, a product of Ghana's "Right to Dream" academy, becomes Chicago Fire's second designated signing - one of three players the club can sign outside of the $3m salary cap Major League Soccer imposes on each franchise. "I'm really excited to be a part of MLS and the Chicago Fire," Accam told the club website. "The commitment that the Fire showed me was the main reason I chose Chicago over other offers that I had. "I would also like to thank the coach Frank Yallop and the owner Andrew Hauptman for believing in me and giving me the opportunity to play for the Fire. I cannot wait to repay their faith." After luring Accam from Europe, the Eastern Conference side are excited about their new acquisition, who began his professional career at lower league side Ledbury Town in England. "David is an exciting, creative player with a goal-scoring mentality," said Fire Head Coach and Director of Soccer Frank Yallop. "I'm pleased that David will be joining the Fire. He's a key piece as we continue to build a deep squad in preparation for the 2015 season and we're looking forward to having him on our team." Chicago Fire finished second from bottom in the MLS Eastern Conference last season and have also signed Nigerian forward Kennedy Igboananike ahead of the start of the campaign in March 2015.